I love taking walks around the neighborhood with my kiddos in the afternoons. It's a good way to get some fresh air and get their wiggles out. Sometimes we just walk, but many times we have a "goal" on our walks. Last week, we used one of our walks to tally and graph the colors of cars we saw. It's very easy to adapt an activity like this to meet the needs of many different ages of children all at once. Each child brought a notebook and a pen. Before walking, we made color-coated spots for tallying (red, orange, yellow...etc). Using color coating instead of words made it possible for even my 3 year old to participate. Older kids can practice their color words by just using the names of the colors for tallying. Then we were off! Each time they saw a car, they stopped to mark a tally on their chart. My 7 year old knows how to tally 4 lines and mark it off with a 5th, and my 5 year old just marks lines. My 3 year old was simply focusing on trying to put a line on the correct color spot. I was honestly a little shocked at how focused my 3 year old was on the task at hand. Later, we took time to graph their results. I printed some simple graphing charts from online. To adapt for age differences, I gave my 7 year old a graph that counted by 2's, and my 5 and 3 year olds a graph that counted by 1's. "Which car color did you see the most of?" "Which car color did you see the least of?" "How many blue cars did you see?" "Were there any colors you didn't see any at all?" "Which car color was your favorite?" 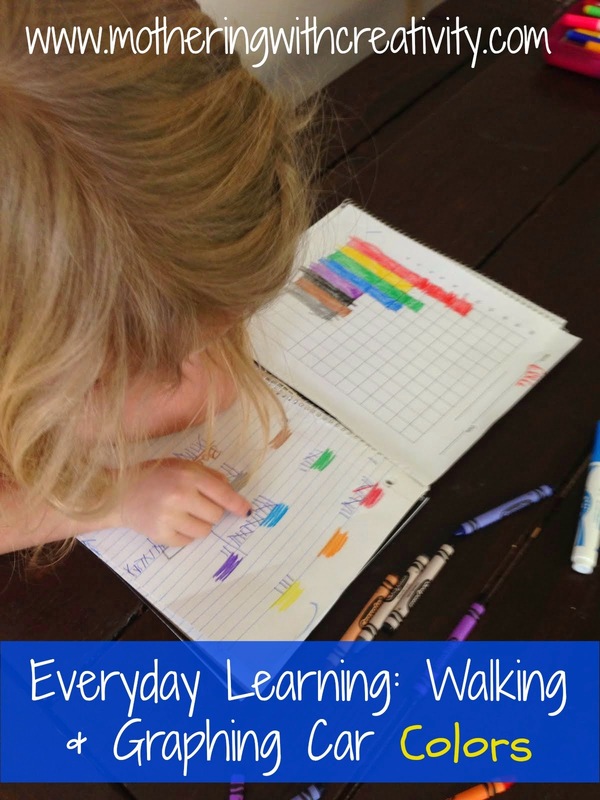 It was an easy way for us to incorporate some "learning" into an everyday event...taking a walk! How do you incorporate learning into everyday things?